A puppy mill will create a litter of puppies for the sole purpose of making money. While these are typically thought of as large operations, the term puppy mill can apply to an individual as well. The puppy mill formula is simple, …buy any registered (AKC or one of the new “fake” registries like CKC) male and any AKC registered female, and start making puppies. Puppy mills sell most of their puppies in pet stores and the classified section of local newspapers. Some also advertise in dog magazines and on the internet. Puppy mills don’t compete in AKC dog shows or field trails because it is far too expensive. To avoid paying stud fees, they frequently own both parents. If not, they will breed to any local stud dog for convenience. To give the impression of quality, puppy mills sometimes use the term, “champion blood lines” which may simply mean that one of the sixty four great, great, great, great grandparents in the pedigree was a champion. Most puppy mills don’t have the parents genetically tested for illnesses. Most puppy mills do not give their dogs any health care — they think it is just too expensive to take their dogs to the vet and they even allow female dogs to die giving birth rather than take the dog to the vet to have a C-section. When a female dog from a puppy mill is no longer a good “producer” (i.e. too old to have puppies), they are often killed. 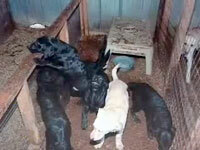 Some puppy mills sell puppies that they say are purebred, but are really mixed breed dogs. Puppy mills produce AKC registered pure bred puppies of poor quality in terms of temperament, ability, genetic soundness, health and physical conformation. ***Puppy mills will sometimes offer to “deliver” the puppy to your area as a service, but actually they offer this service so that you don’t see the horrible conditions where the puppies live. Do not purchase a puppy from a puppy mill. Like a puppy mill, a backyard breeder also produces AKC registered pure bred puppies of poor quality. The difference between a puppy mill and a backyard breeder is that a backyard breeder is usually a nice person with good intentions. They create a litter of puppies because they think their dog is just wonderful, or that their dog should experience motherhood once and or because they think that a litter of puppies would be so much fun! Sometimes they also breed their dog just once or twice to make some extra money. The backyard breeder will find any AKC registered mate nearby (sometimes with the help of their veterinarian) and have a litter of puppies. Backyard breeders do not compete in AKC dog shows or field trials, and usually have no clue as to the AKC standards for their breed. A very few backyard breeders test for genetic diseases on the advice of their veterinarians, but most do not. Backyard breeders are adding to the overwhelming problem of surplus pets — there are already too many puppies out there and thinking a litter of puppies would be fun is no reason to add to that surplus. Backyard breeders will sell the vast majority of their puppies by placing ads in the classified sections of local newspapers. Backyard breeders produce AKC registered pure bred puppies of poor quality in terms of physical conformation, health and genetic soundness. They may or may not have a good temperament. A pet store sells puppies that come from puppy mills or backyard breeders. A responsible breeder would NEVER, EVER sell their puppies to a pet store. In fact, it is against the written code of ethics in most breed clubs for any breeder to sell to a pet store. 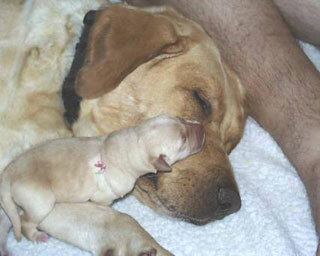 Pet Stores sell AKC registered pure bred puppies of very poor quality in every way. Some people feel like they are rescuing a puppy when they buy it from a pet store, but the sad fact is that by paying for a puppy in a pet store they are only increasing the demand for more pet store puppies. Do not every buy a puppy from a pet store. In addition, obviously, no reputable breeder would ever sell their puppies at a flea market. Flea markets are a way for backyard breeders and small time puppy millers to unload extra “stock”. Many of the puppies they produce are mixed breeds, even though they tell you they are purebred. They will often also produce fake registration papers. These dogs are usually very sickly, very poor quality and may not have a good temperament. Never buy from a flea market! Someone who wants to breed but chooses the higher road because they don’t want to contribute to our nation’s shameful pet over-population tragedy. SPOT in no way endorses breeding of any kind, whether it be by “responsible breeders” or otherwise, at this time when our society kills millions of loving pets due to homelessness. 30% of these casualties are purebreds. We believe that the breeding should stop until the killing stops. SPOT doesn’t believe that pets should die so that people can pursue the hobby or glory of breeding the perfect dog or cat. These are living creatures, as are you and I, and we don’t believe that they should suffer due to human greed or egotism. Though some of you might want to breed your pets, please refrain as your doing so will contribute to the tragic deaths of millions of dogs, cats, puppies and kittens in our nation’s shelters. Please visit your local shelter, visit pets 911 or contact a rescue group. Please do your part to help reduce the number of animals that die in our nation’s shelters. Please do not contribute to this national tragedy.